- Developing, scanning (scans since 98') and printing film (including single use cameras) since 1990, open for processing 6 days a week, Monday to Saturday. - C41 Colour film developed on site with Kodak Professional C41 QA colour chemical quality control monitoring for consistant reliable results. - We have the capacity and can process 200+ C41 films per day. - True black and white film hand developed and E6 positive slide film dip and dunk developed by our trusted out-lab partners. We provide neutral scans, true to the film type stock shot, checked for quality assurance by our very experienced lab operators. Our same high level of professional quality control applies whether you choose same day or longer service times. 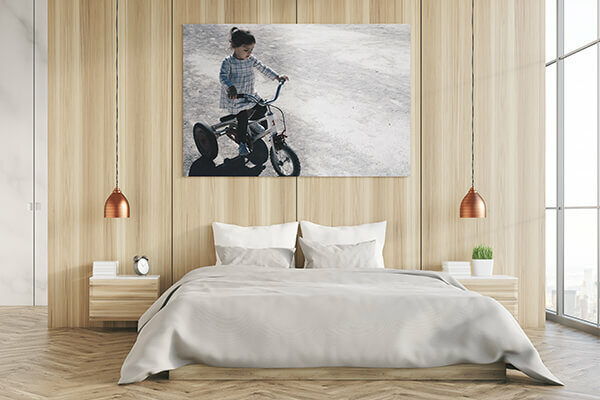 In addition to scans we provide a multitude of ouput options, whether it's real prints on metal, canvas, gifts, photo books and more. We are here to help and advise, with over 80 years combined experience with our team. If you're just starting out or shoot for a living; we're here to help you achieve the very best from your photography. 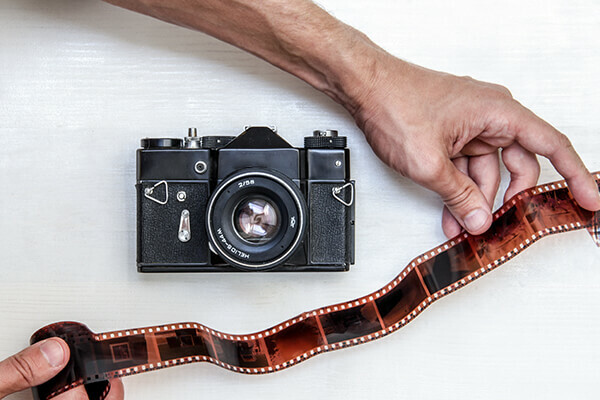 No matter what brand of film you have, we'll develop, scan and print it to perfection. Our new website does not have online film ordering yet! We carry a complete range of Kodak and Ilford film in 35mm & 120 at competitive prices, call or email for details or ordering. We also stock Lomography 800 C41 & 120 X-Pro 200 in 120. Use our pricelist/mail order form for film devloping, printing and scanning, we will post it back to you using Australia Post or Express Post satchels. From just One Hour, depending on workload, last films for Same Day leave by 3.00pm Monday to Friday or 1pm Saturday. 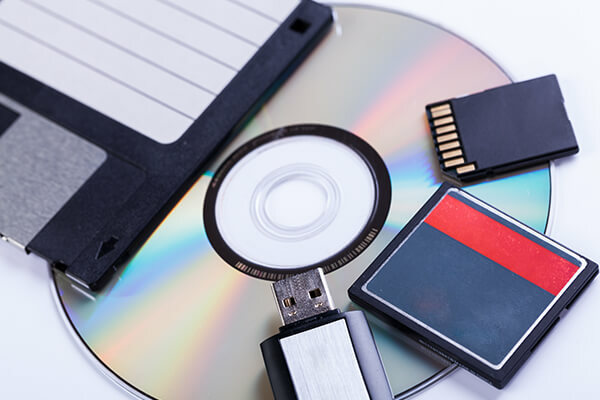 Drop off at Fotofast 24/7 afterhours dropbox, also Culprit Club 5A Winn Lane, Winn St, Fortitude Valley. Want to process your own black & white film? We stock a large range of film processing chemicals and equipment. Call for details. Agfa FP200 film processors, Noritsu HS1800 & LS600 film scanners, Epson Surelab D3000 archival inkjet printers, Canon Image PRO 2000 wide format colour archival printer. We also process all brands of C41 process film on-site. 35mm (full frame, half frame, xpan), APS, 110 and 120/220 in 6x6 6x45, 6x7, 6x9 formats. This includes Black & White film that is designed to process through colour chemistry. We also develop True Black & White film , ready from just 3 week days. We can cross process 35mm, 120, 220 & 110 film (at no extra charge), which gives increased contrast and saturation with a lean to yellow hues. E6 Slide processing is available with a one week turnaround. We can process all types of film from these cameras, we process them the same as normal 35mm film. All our printing services are available in Matte / Lustre or up to 6x9" on gloss. 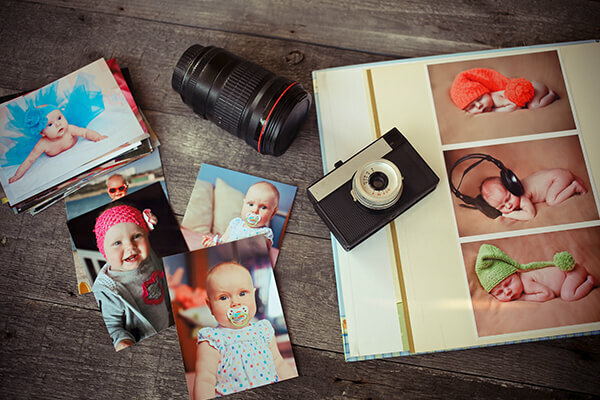 Gloss is ideal for general-purpose photography. It gives the print extra depth and contrast. 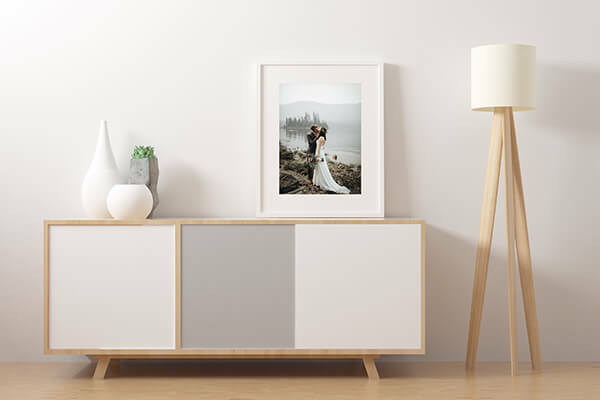 Matte is recommended when the print is to be framed, for display or when people will be handling the photos often. The matte surface does not show finger prints as much as a glossy photo does. Developing & printing/scanning from 35mm colour film are completed SAME DAY from just one hour, depending on work load. For 120 and 220 colour film service time is from two hours. For true black & white film, the service time 3 week days. For slide film processed dip&dunk in true E6 chemicals drop off by 5pm Mondays and we'll have them ready the following Monday. We accept orders for same day film processing right up till two hours before the store close. Watching your budget? 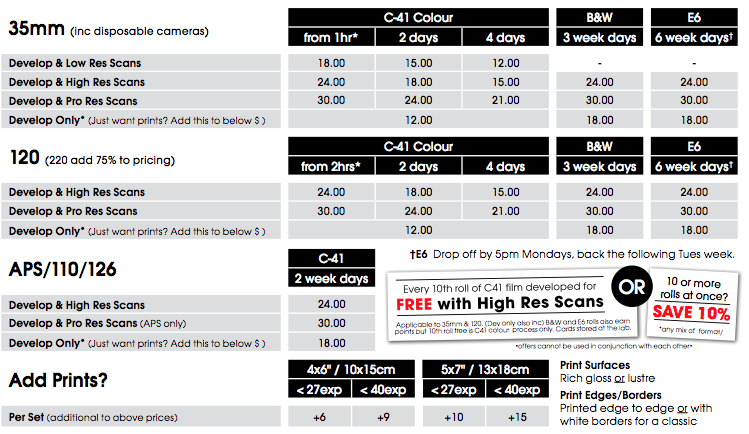 C41 colour develop and scan now has great deals with extended 2 or 4 work day service times. Developing film is a passion we've had since 1990 so we do understand it's not a cheap love to have! Film processing, Australia, Brisbane, Queensland, NSW Sydney New South Wales NSW, Adelaide, South Australia SA, Tasmania Hobart TAS, Perth WA Western Australia, Darwin Northern Territory NT. Download our film processing mail order & pricing form to send with your order. Using the film processing mailorder/pricelist, provide details of what you require, with name, address and contact phone number. We will contact you as soon as we recieve your film re payment.etc. Standard parcel post from three days, depending on location, Express Post next day depending on location.